Well the day had finally come and I was super excited to say the least! 1 because I was selected to be an ambassador and 2 because it was my first official race! Now I must say that the feelings of excitement were mixed with nervousness. Nervous about my first official race and also because this would be only the 2nd time ever that I would be running 15k. It all started the night before…. I had to get everything ready since I had wake up at 4:45am ugh! 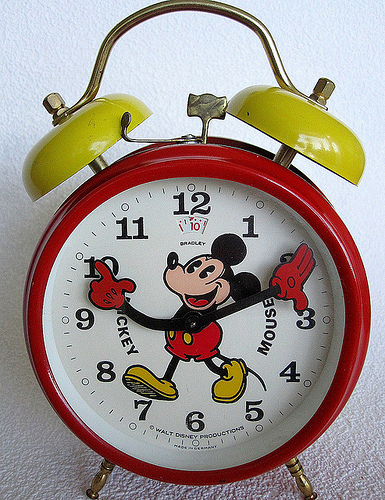 Thankfully for me waking up at that time is not unusual at all and I am quite comfortable waking up at that time of the morning. So that night I prob spent over an hour pacing back and forth and going up and down the stars trying to pack a bag that in hind sight I prob didn’t even need! “What should I pack? ?’ “Should I bring a change of clothes?” “Do I bring my flip flops since I love being able to take my shoes off right away after running?” “Do I pack a Clif bar for after? Will I need it during the race?” I ended up settling on taking my backpack with a change of clothes and flip flops as well as my running gear: HR monitor, Garmin, headphones. This way I also had a place to keep my wallet secure! I even slipped that Clif bar in after all! If i was bringing the bag then why not! Finally I went to bed still nervous about sleeping through my alarm and probably a later then I should before a race. I usually don’t have an issue with 4-5 hours or sleep. Morning came and I bounced out of bed with excitement! I ate my oatmeal grabbed my bag and jumped in the car…. Somehow I am 10 mins later then I wanted to be!! Grrr. I still made it there in good time and was able to park and be out of the car by 610! One of my fellow ambassadors was gracious enough to pick up my shirt and bib for me a few days before so I bbm’d him to pick a place to meet. Crap he’s going to be a lot later then I had expected!! Oh well time to check out the surroundings! 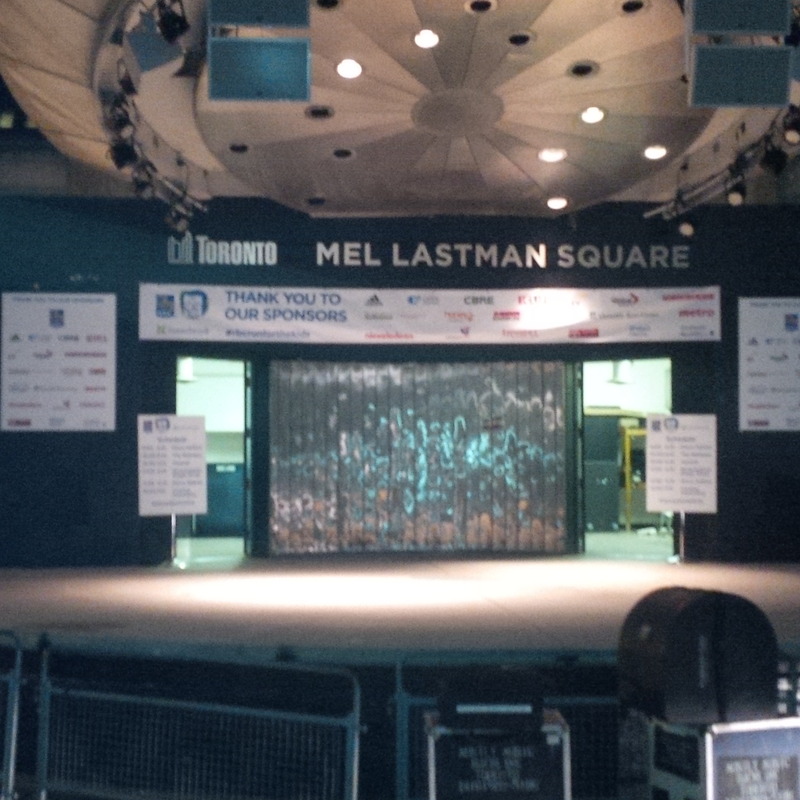 I found the stage for all the amazing entertainment that was planned post race! Really cool idea! They had a bus to get all the amazing volunteers out to various points along the route! Special shout out to all the volunteers that day! They were all knowledgeable, directed people to al the places they needed to go, handed out water along the way, kept us all on track and cheered us on! I tried to thank each one that I ran by! These people really made race day run smoothly and kept us pumped! 6:45 met up with my fellow ambassador quickly changed shirts (the race shirt was amazing! It was a Karbon fitted race shirt I now LOVE fitted shirts for running!) and pinned on my bib! Got my bag checked; which was amazingly smooth, kudos again to the volunteers. 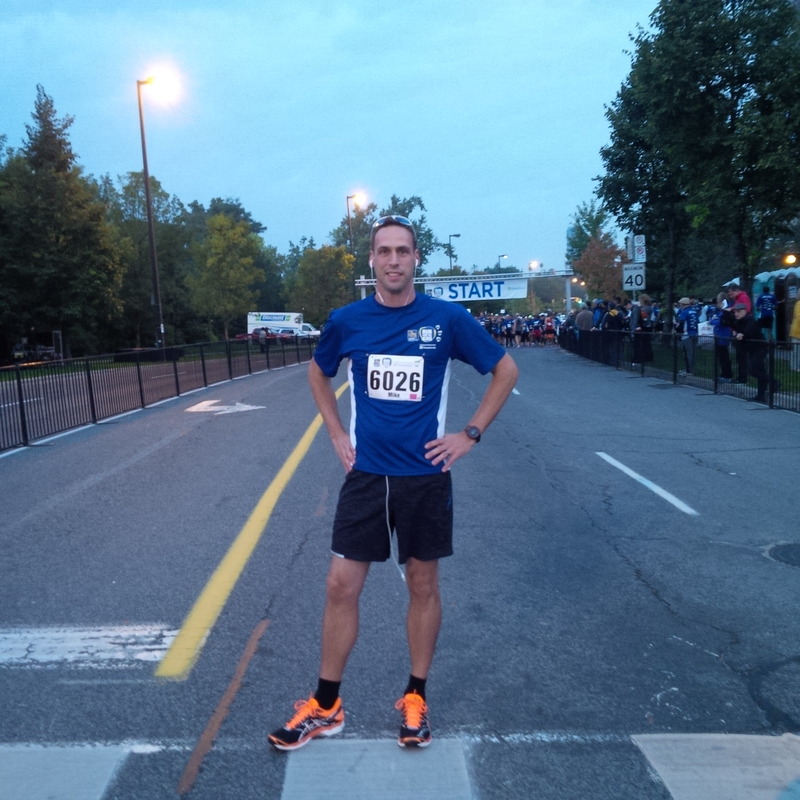 Now it was off to the start line to make the 7am kick off! All smiles here on my way to the start line! Thanks to a Toronto Police Officer who was willing to take this pic for me! I made my way through the sea of people and found my way to the pace bunny that I thought I would keep (1:15-1:20). Time to set up my music and get my Garmin all cued up! Wow NOW I am nervous lol. All this is SO new to me and standing in a huge corral all by myself and just my thoughts is not easy!! Thankfully the race announcer and a representative from the Family Navigation Project were speaking on the podium so I cold listen to that and ignore my nerves! And then we were off!! When you’re not at the very beginning of the line the bang of the gun and confetti are just not as dramatic. But for me it was still very thrilling. The pack then starts to move and people start jockeying for position and space. I am not a run the whole way kinda guy. I subscribe to the Jeff Galloway Run/Walk/Run method and had set a goal for this race of 6min run and 1:30min walk. This method works amazing when your at home and running by yourself. However I quickly learned that in a race/run setting the challenge is finding the right place to slow to the walking pace without getting in someone’s way! Then when I was on my running phase it was difficult to get passed other runners and back to my 8:30 min/mile pace. As the race went on I learned quickly where to place myself to make it happen! It didn’t work all the time and often found myself caught behind a group that was running at a slower pace but I have a lot of patience and eventually found a way to break ahead again. 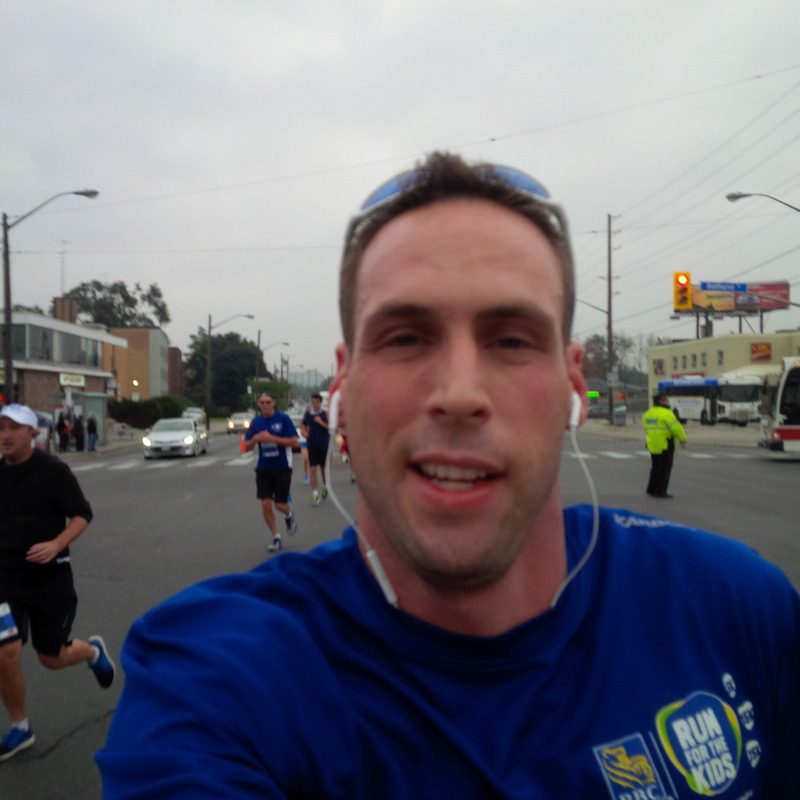 I even had time to take some #Runfie’s …..I didn’t know how hard this is to during a race until now! lol. 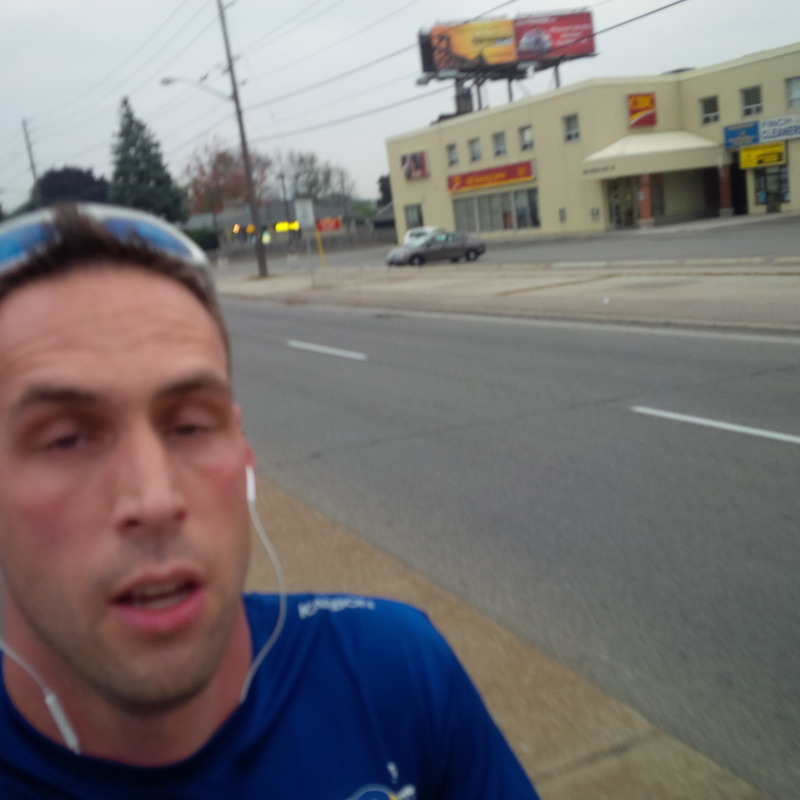 These shots were taken at approximately KM5 and I was feeling great! I was a little nervous having to run basically in the centre of Finch Ave however there were lots of cones set up and many of Toronto’s Finest (police) out to direct traffic and keep us all safe. This is another time I took the opportunity to thank each one I came across! Speaking of the route, I thought it was amazing! 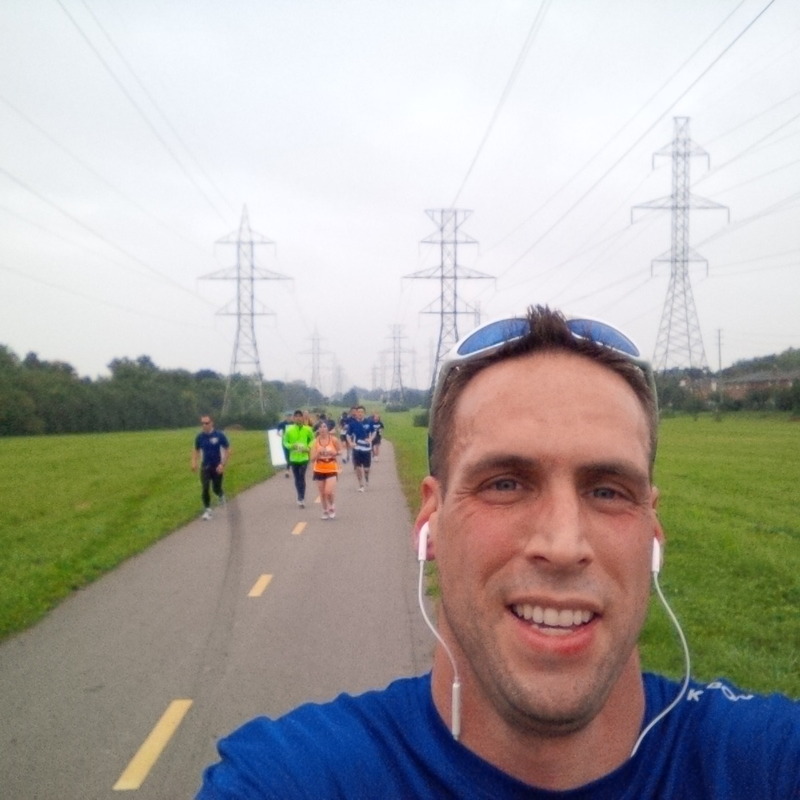 It was a little tight with my pace group running in the middle of Finch but not too crowded. I had heard that the water station just after the 5th KM was a challenge for runners since they had to cross live traffic to get to it. However, I actually didn’t even notice this station, perhaps because it was so far off the track but also because I didn’t require water at this time. From what I saw (I only tried to stop for water once and found it really difficult and annoying to try and drink from a cup and run at the same time) there were lots of water stations as well as porta-potties ( thankfully I did not require these either). I suggest, however, that large garbage buckets be placed right after the water station for runners to throw their cups away. It was a big mess on the grass and road of empty cups when I went through. The run through G Ross Lord park was beautiful and I wish I had taken a pic during this section to show you! 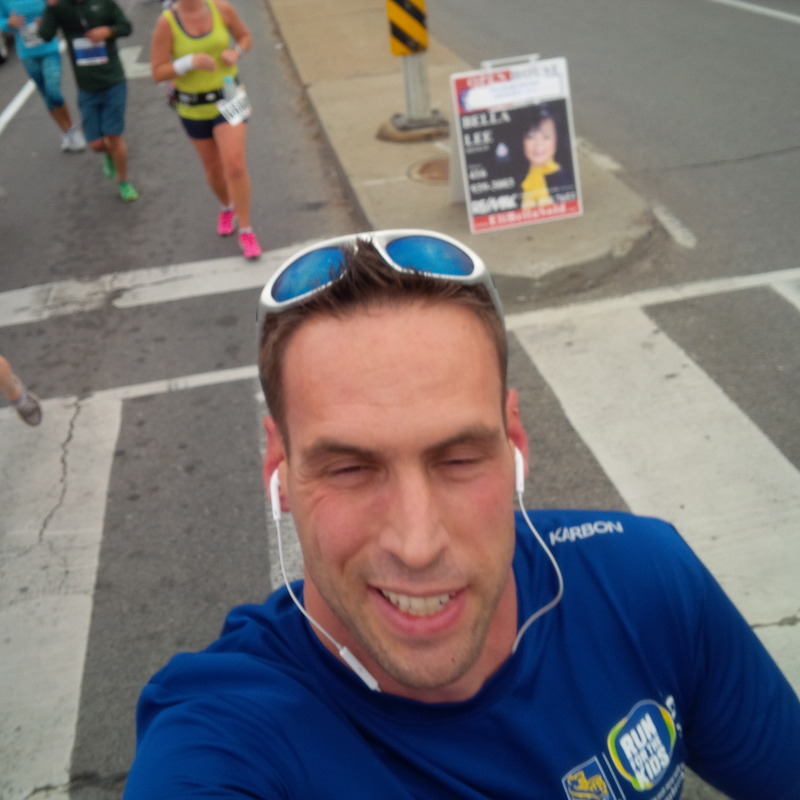 The best I have is this selfie at the 10k mark I took to pump people up at getting to the 2/3 mark of the race! At this point I was still feeling great and not burned out; thanks to the run/walk/run method. Mentally for me this point meant that it was almost over. I had broken the race into 3x5K sections so now all I had to do was get through the last 5k and I did not feel burnt out at all! In fact after multiple attempts to take this selfie and the frustration being there so long I was able to run faster than my 8:30 pace to catch back up with the group I was running with. KM 13 and still smilin! 🙂 I run for the experience not the times so I love taking pics and documenting my runs! 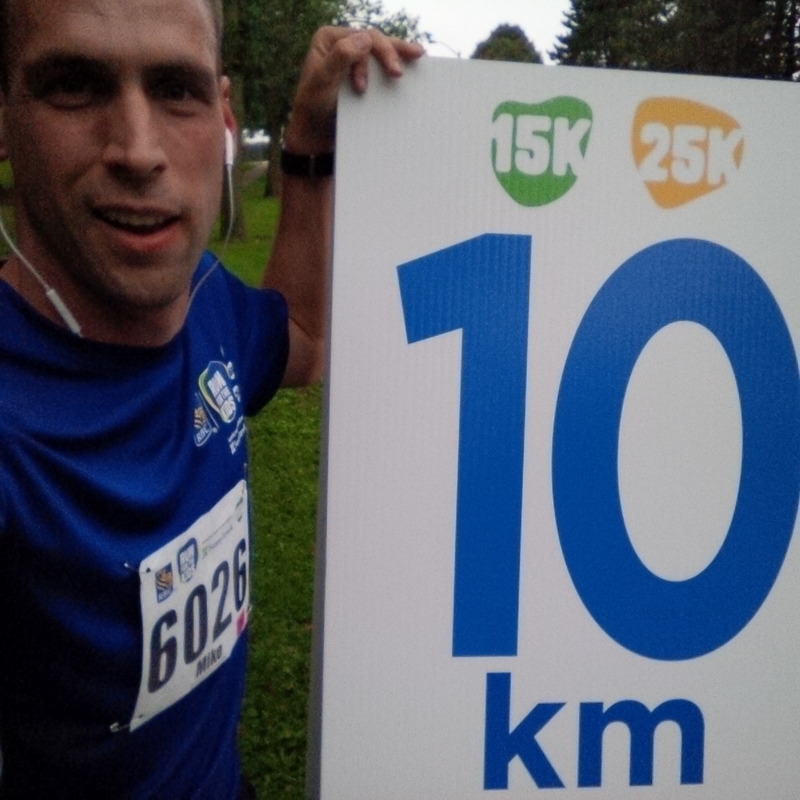 From this point I am getting really excited and tell myself “Ok from KM 14 you’re not taking a walking break and you’re going to power through to the finish” This seemed to be a very manageable goal and my legs and cardio felt ready for it. So I started running, and running, and running, and running ….. Insert Dory’s voice from Finding Nemo “Just keep Running” ….”What the hell! 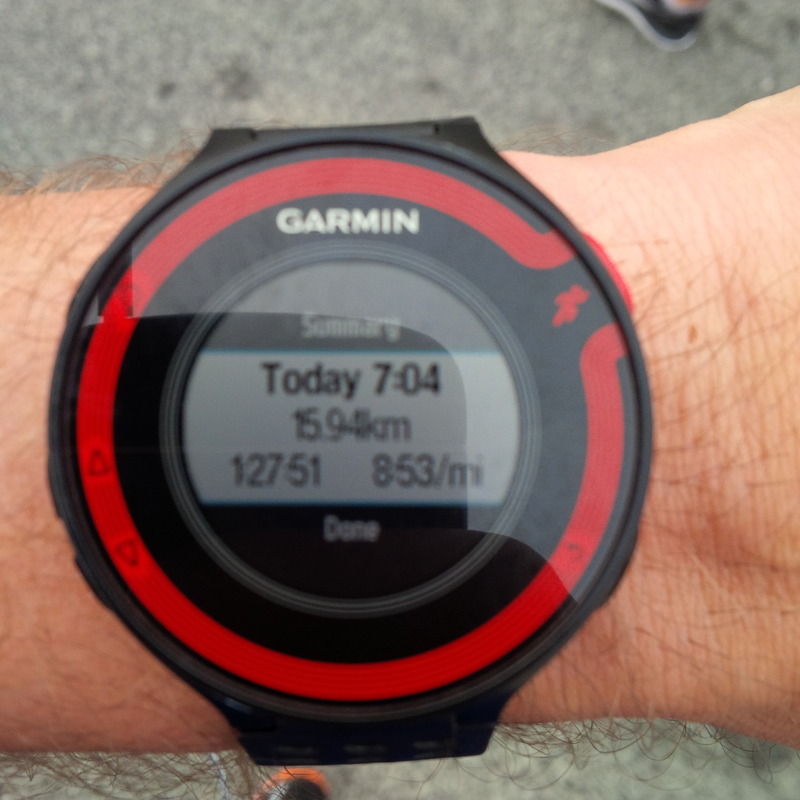 My watch says 15K and I’m not even close to seeing the finish or the runners making any sort of turn to the finish! So I keep running…. now my cardio and legs are starting to complain…. I start to have this mental war with myself “Ok just take a break your legs are starting to hurt and you’re really starting to get out of breath” “No you said you were going to finish strong for the last KM” back and forth and back and forth. 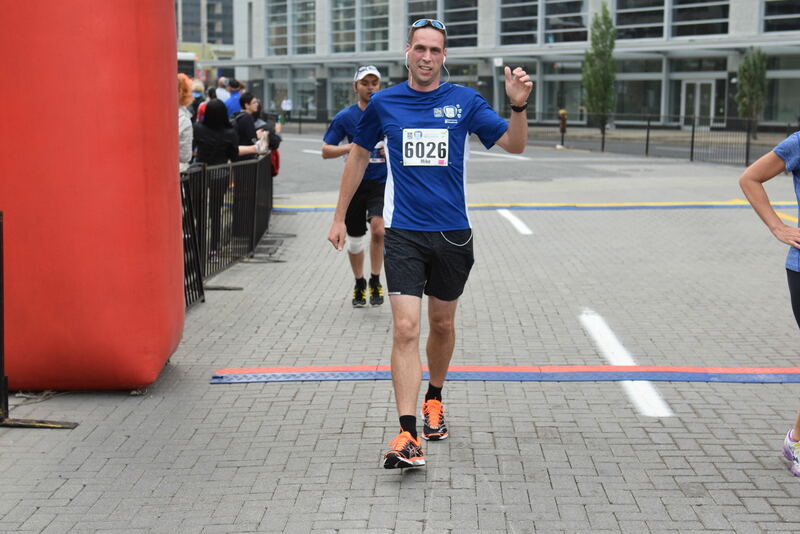 The one thing that was keeping me going was that I was being beginning to pass a lot of runners (love how the run/walk/run really conserves your energy). Then finally the finish line!! My first OFFICIAL race finish time!! I am quite proud of myself for this time! The best part of it all was getting my first ever bling!! Now that the hard part was done and out of the way it was time to check out the post race expo! I finally got a a chance to try HoneyMaxx since so many people have been raving to me about it! Loved it gotta try more! Then I turn around to the booth beside to see one of the media sponsors Global Toronto where I found the emcee Leslie Roberts. Mr. Roberts was very happy to meet and chat with me! He is also a very big supporter of Paramedics. He even ran the 5k run that day! From then it was time to grab my bag (again seamless!) and get some food!. There were baskets of bananas juice and chocolate milk perfectly spread around the square so I grabbed my self a sampling as a I walked around. Next it was some coffee (perfect idea btw since the 15 & 25k runners had to be up so early) and a breakfast burrito. The digital ambassadors were asked to meet up at 950 for a 10 am photo its unfortunate that I was unable to meet everyone; I was really looking forward to that. The 4 I was able to meet in person were amazing and it was so nice to finally meet them. 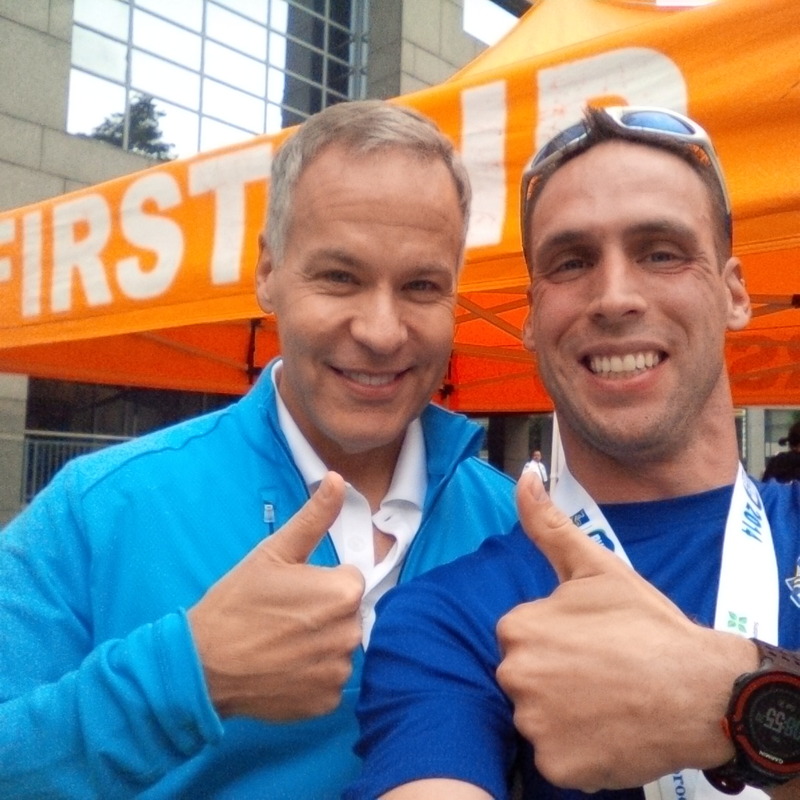 I want to take this opportunity to commend all the social media ambassadors for all their hard work and dedication to fund-raising, education and promoting the run! 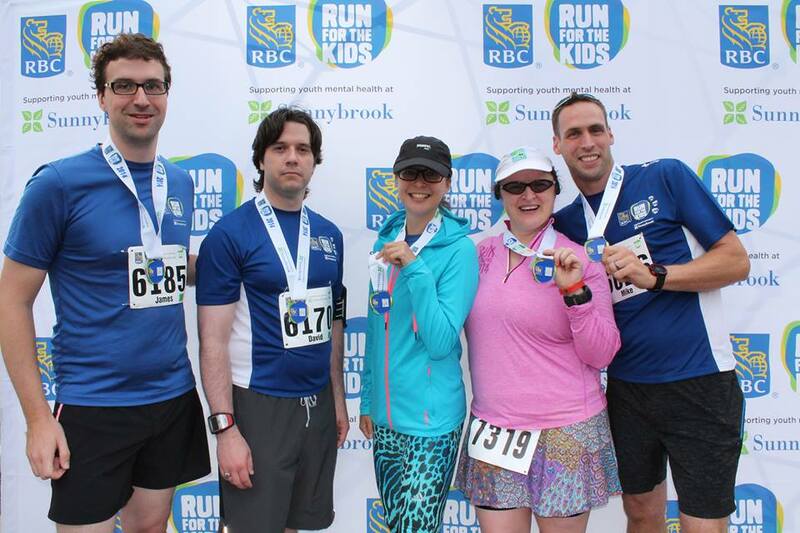 The run has doubled in participants in just two years; some of that success has to be attributed to all our hard work! I can only wish that I as well as all the other are asked back next year to continue to build this amazing race! From there we parted ways and myself and Dave decide to sample the grilled cheese that everyone was raving about and we weren’t disappointed! In hind sight I kinda wish I had stayed around longer to enjoy the live music and meet some of the Canadian Olympians that were there to support the runners. There is always next year, maybe my kids will even be able to attend so they can enjoy the Nickelodeon Kids Fest! Overall for my first racing experience I couldn’t have picked a better race! From what this race supports to the whole experience on the day to the feeling of satisfaction of being an ambassador I dont think any other race from now on will compare! I highly recommend you consider this race next year in your running schedules! I would like to thank all of my donors! I never imagined that I would be able to raise over $700 for this worthy cause. Thank you to Claire our Jedi master of sorts for providing us with all the guidance, support and information we would need to fulfil our role as ambassadors. Thank you to my fellow ambassadors; pat yourselves on the back I loved working with you all and you all did amamazing job! Thank you to all the volunteers the Toronto Police, Toronto Paramedic Service and all the corporate sponors who made this all come together! 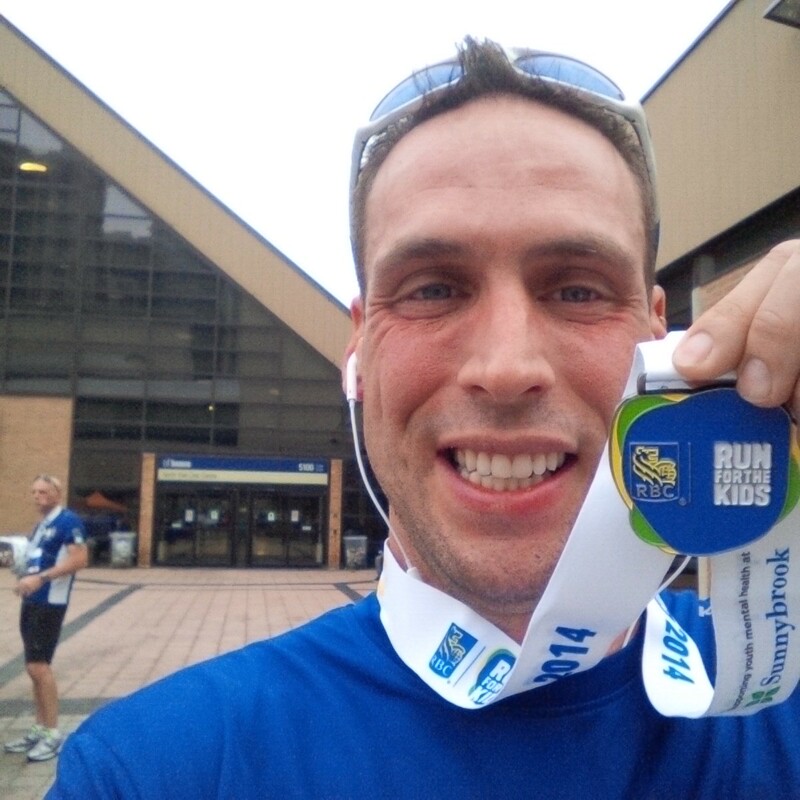 If you would like more information about the Run, the Family Navigation Project and the RBC Children’s mental heal project I have created a fact sheet here (thanks Claire). Do you remember your first race/run? How did it go? 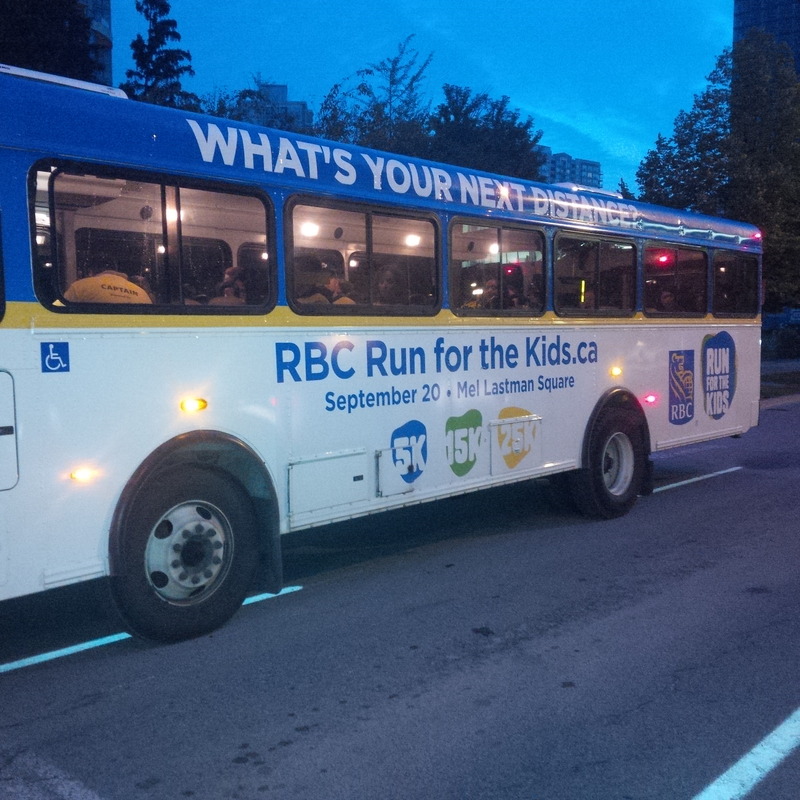 By Mike van Mil in RBC Run for the Kids on 2014/09/28 . Thanks Kim! I’m officially addicted!! Cant wait for #WineDineHalf!!! !